A few months ago, Sylvia LaFair and I connected via LinkedIn. She is the President of CEO, Creative Energy Options, Inc., a global consulting company focused on optimizing workplace relationships. We exchanged quick messages that ended up in a phone conversation and invitation to visit her at The Country Place Retreat and Conference Center in White Haven, PA.
Life pointed out to me once again that the Statue of Liberty is in my own backyard. Sylvia's beautiful place is tucked away in lower Luzerne County, a mere 17 miles from my office. I was greeted by Mary Jane Saras, LCSW, Vice President, Leadership Development for CEO, and after a wonderful visit with both dynamic women in this warm, peaceful and inviting environment that is the retreat, I left with two new friends and a gifted copy of Sylvia's book, Don't Bring It To Work. I once heard a director level manager say to someone, "When you enter those doors, leave your personal life on the other side, understand?" How often at the office have you wondered how her family stands her, or his wife puts up with him? How the kids don't run away from the Commander's field camp or dream how nifty it would be if so and so got a prescription for anti-anxiety meds? 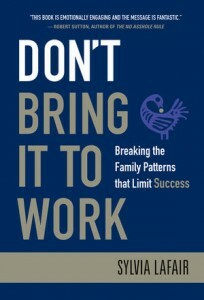 Sylvia models the 13 most common pattern types found in the workplace that need work to bring harmony and ties them right back to family life, to help break the family patterns that limit success. Her work echos thoughts many of us have - but that she succinctly makes sense of, analyzes and offers a solution to through the PatternAware leadership model. Do you recognize types like Super-Achiever, Rebel, Victim, Clown, Persecutor, Rescuer and Drama King or Queen? These are not strictly workplace personalities, they have far-reaching historical significance, learned as children - patterns never broken to develop healthy relationship behavior. The book takes an in-depth look at each type to the point that anyone with a minimal amount of self-recognition should be able to self-identify. But finding the solution doesn't end at recognizing the unhealthy patterns, it's where the work begins. Sylvia's years of work as a clinical psychologist and family therapist before getting into office politics bring an especially acute perspective on how family comes to work with you. To provide even more perspective on family patterns, Sylvia takes readers through the process of Sankofa Mapping, a proprietary coaching process she developed in which you "graphically explore and organize relationships in your family system and apply the results to your work life". She writes that it goes much further than your family tree and that by looking at how you and your family has responded to family crises you'll be able to understand how that behavior has shaped your behavior patterns in the workplace. For anyone who cares about optimal performance, team cohesion, interpersonal relationships and personal and professional growth, Don't Bring It To Work provides many takeaways. The one that really stands out to me in a big way is that "You become whole by owning the parts of yourself you would rather ignore". I admit to occasionally retreating from initiator to the safe confines of avoidance if I feel uncomfortable.